SpaceX is pretty proud of their recent successful launching and landing of the company’s Falcon 9 first stage rocket, as they should be. 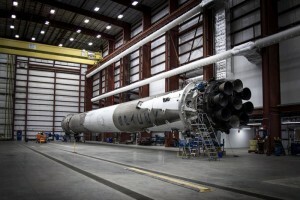 It’s an incredible step forward when it comes to the future of reusable rockets. The picture above represents the first image we’ve seen of the used Falcon 9 booster since it’s landing, and I have to say, it looks darn good for something that was able to get into orbit and back. Elon Musk says no damage was found on the Falcon 9 after its historic landing, which is now being housed inside a hangar at Cape Canaveral, Florida. Given the significance of this particular booster, Musk will not launch it again, but he plans to fire the booster once more in the near future to demonstrate rocket reusability.